I confess, I was never curious about the Puritans until recently. Quotes posted on blogs, Facebook, and Twitter, piqued my interest. Friends' recommendations sealed the deal. Still, I was certain where to start. When I saw J.I. 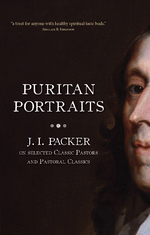 Packer's book, Puritan Portraits: J.I. Packer on selected Classic Pastors and Pastoral Classics, I immediately put it on my wishlist. I was thrilled when Christian Focus Publications offered me a copy of the e-book in exchange for my honest review. Reading Puritan Portraits was a win-win for me, because I wasn't that familiar with Packer, either (though several of his books have been lingering in my "To Read" stack). I found the book to be a wonderful introduction to both Packer and the Puritans he admires. The Puritans felt that reading should encourage our spiritual growth. I believe Packer's work in this book does just that. After reading Puritan Portraits, I have resolved to read more from the Puritans and more from Packer as well. You can read the other reviews at the Puritan Portraits Blog Tour. Thanks so much for being part of the blog tour.